Defiance was a great paranormal YA novel! I am not the biggest fan of paranormal novels and I am very picky on what I like so after the rave reviews and the increased expectation I was afraid I would be disappointed, but for the most part Defiance was brilliant and a thrilling read. Rachel, the main protagonist lives in an enclosed 'town' called Baalboden. She has lived there all her life with her dad. In her world, anyone who seeks shelter lives in one of many enclosed towns ruled by someone. Women are not allowed to walk in the streets of that town alone and ignoring this rule could lead to her immediate death. Each woman has a 'guardian' who has to be with her when outside at all times. Since Rachel is not 18 yet, meaning she has a few months till she gets picked for marriage, her father is her guardian. When her father goes missing for over 6 months, he is declared dead and his apprentice, Logan is declared her guardian. Now this puts them both in an awkward position, a. because a couple of years ago Rachel was turned down when she confessed to Logan, and b. Logan is almost her age! However C. J. Redwine does not indulge in this child play and jumps directly to action. Rachel doesn't believe her father died and so does Logan. The plotting begins, then the mistakes happen, feelings get in the way, the tyrant king dirties his hands concerning both Rachel and Logan and they have to race against time and away from the king to stay alive and find her father and the mysterious box that started all of this. Now what I found misleading in the synopsis is 'Logan and Rachel battle their way through the wasteland'. When I found out that what I thought wasn't what actually happened, I got frustrate. They were split apart, and I love journeys that occur with both characters like Under the Never Sky by Veronica Rossi. It got me a little bit impatient since it took up a big portion of the book, but I still kept on reading because reading from both POVs still keeps you in the loop with both characters that you don't really miss anything. The plot leading to the ending was very promising, we get some of the questions answered and the reader, myself, and the characters start gaining some hope on how to end all of this. However when the ending is taking place in the last couple of pages I was shocked, it was not what I was expecting and I always love it when an author surprises me, even if that ending wasn't the one I wanted, because its no fun when we always get what we want! Even if the ending was a bit confusing. So Defiance... it is definitely a great start to a series and a new sub-genre to the paranormal genre. I personally feel it is a bit of a paranormal/post-apocalyptic novel, but who cares about the label? I totally enjoyed Defiance and if it appeals to you, pick it up right now! Great to know you enjoyed it! I'm actually looking forward to reading this, and I'll keep in mind about the misleading synopsis. 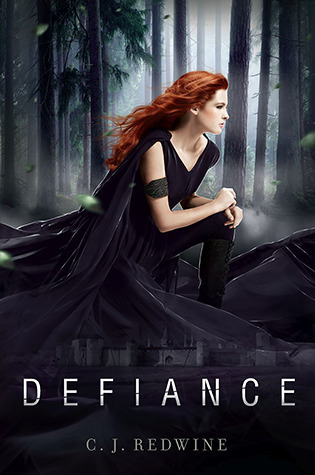 I am not a great fan of paranormal YA as well but Defiance looks like a book I will enjoy and I'm sorry you didn't enjoy it as much. I believe endings could either make or break a book. It's a good thing that you still like Defiance even with the surprising endings. I for one can't wait to know what that is! Fabulous review, Juhina! :)!